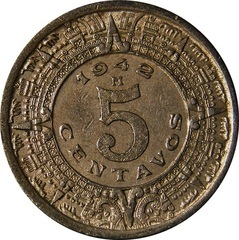 In 1936, a new 5 centavos coin with a composition of copper-nickel was introduced as a replacement for the previous bronze 5 centavos coin that ran from 1914 to 1935. Besides a different composition, the new coin was smaller in diameter (20.5 mm versus 28 mm) and all coins were minted at the Mexico City Mint from 1936 to 1942 but no coins were issued in 1939 & 1941. The reverse design features the denomination “5 CENTAVOS” within the Aztec Stone Calendar. Above the denomination is the year of issue. 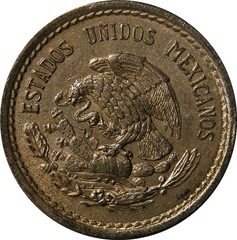 All coins were minted at the Mexico City Mint and display an “M” mint mark in between the year of issue and denomination. The key to the series is the 1938 issue. Considering the series is such a short run (only minted for 5 different years) there are quite a few examples available to collectors (129 million total coins issued). With a high total series mintage, prices are fairly reasonable with the exception of 1938 issues and this includes uncirculated examples.